I love, while traveling, to find new, exciting places to eat. Whether it’s a fine restaurant, a diner, streetfood or … it doesn’t matter. It’s always fun to investigate and find new good places and different food and flavors to explore. Even if it’s a city or a country, where I’ve been countless times, there is always something that changes. What has happened, what is closed and what has developed since last visit. Fortunately, I still have a lot of places to explore and visit in Antalya. It is such a big city with a huge food scene, so it might be impossible to know them all. And on my last trip, where I was alone, I had a few places, I was curious about and really wanted to try. Several of the places I have been recommended by others, who live in the city. 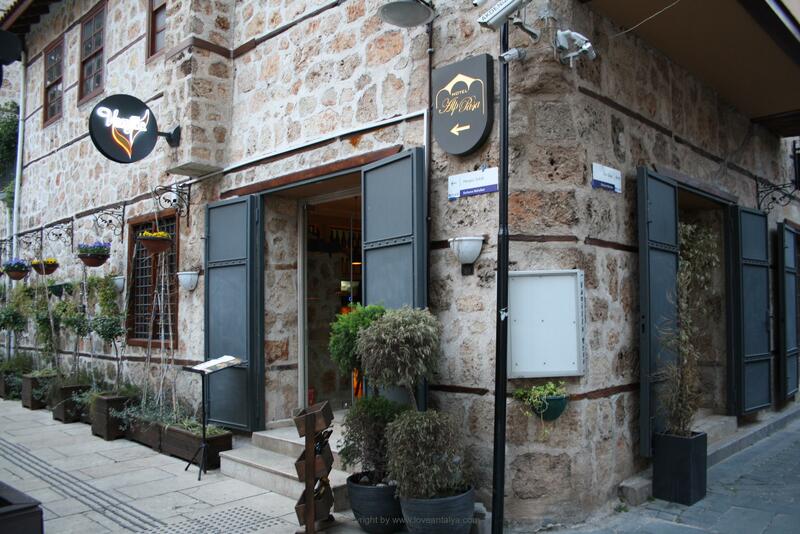 And especially one place, I heard of again and again – Vanilla Lounge Restaurant in the middle of the old town, Kaleici. I was told, that this was the place to visit if you wanted something special, something nice and cozy with outstanding delicious food. Of course I was curious. I knew that the restaurant had existed for quite a few years, so now it had to be the time to go and try it. And then it was more than difficult to ignore, when I passed by. It looked just so nice, relaxed and authentic. At one time so decadent, tasteful and elegant with soft velvet chairs and beautiful marble tables, but at the same time so relaxed and original with the exotic grids on the wall and the many fine details throughout the place. YES, I’m a sucker for decor and so it just went right in (I wondered how I could take the big round marble table with me 😀). I got a feeling of a true metropolis vibe, like Barcelona meets Izmir meets Copenhagen. Something I’ve really missed in Antalya, because it’s a big city, but has so far lacked some of the exclusivity and goodness that is easy to find in other cities. The Vanilla Lounge Restaurant is not a big place, but that is a positive thing, I think. Inside the small room there is space for about 28 guests, but they also have a small pavilion outside, where there was room for more. On the other hand, they are fully booked most days (especially Thursday-Sunday) so it is a good idea to order a table, if you want to eat here. I had previously made an appointment with them and I really did not regret it. It was amazing good food, sweet and attentive service, tasty Turkish wine (yes, Turkish wine is kicking a.. for the time being and one thing to really prioritize) and good international lounge music in the speakers. How can you not love this?? As most of you know, I am really crazy with Turkish food. I really like, when the dishes are the same classical – as you can get many places, but still different. When something is done a little different, a little extra to get its own touch and signature. You can not say that about Vanilla Lounge, because EVERYTHING was 100% their own. It was food and fusion kitchen at a very high level with so insanely many details, that it went on and became a real experience. For example, I had small sweet Burgundy-flowers for the main course together with the lamb shank – raised and grown in Kaleici (lamb from the mountains outside Antalya), pickled ginger (like in sushi) for the appetizer’s smoked salmon tartar (it was presented in a large dome with smoke) and lemon foam and kiwi-gelly for the red-poached pear. “Yeeeks” … you may think, “that was weird.” But do you know what? You dont find it peculiar, when you taste it. Only if you start to study the color and taste bombing, you are presented for on your plate. I had to ask to find out, what this and that was to get hold on the taste and the ingredients. It all just felt so natural and tasted eminent. 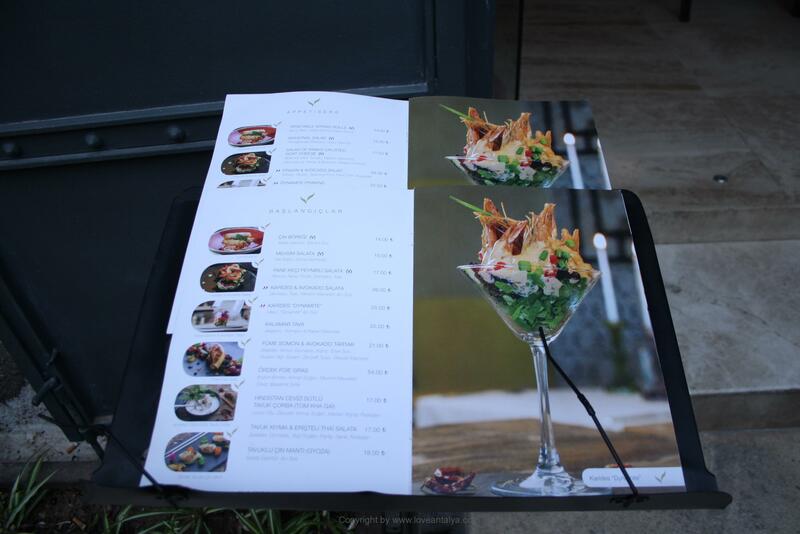 In fact, the whole menu card was quite so phenomenal, and it was really hard to choose, what I should have. It all sounded and looked so tasty and delicious. SoI definitely have to come back and try something more. 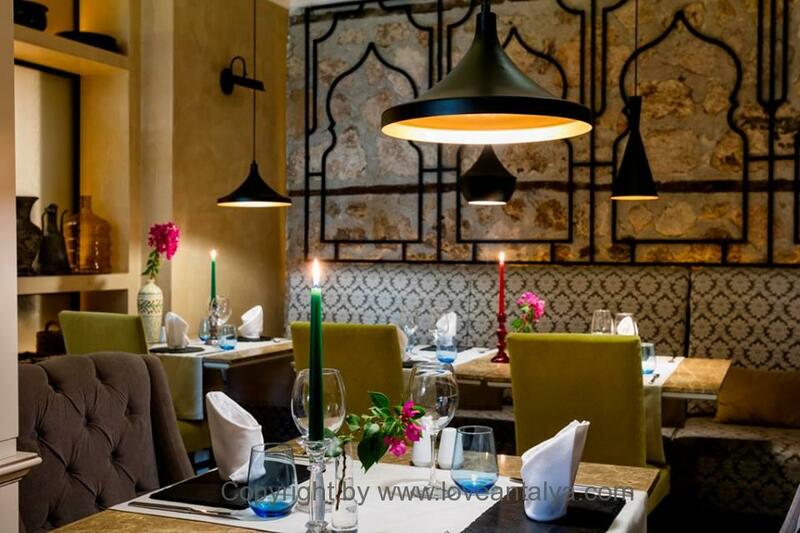 I was annoyed, that I didn’t had the time to come back for lunch the following day, because I would have loved to try their big prawns, pasta with eggplant or the sumptuous dark chocolate mousse. There is also a single burger and several different pizzas on the menu, but trick me, if they are as extravagant as the rest of the food. Vanilla lounge restaurant is not a cheap restaurant, but it does not belong to the most expensive either (compared to European prices). On the other hand, you get an exquisite pleasure and an opportunity for pure pampering. For that reason, I would not say, that it is a restaurant where I would not take (smaller) children to. Maybe in the pavilion outside or for lunch. But if you have the opportunity to be alone with your partner, here is a place to go and enjoy each other, the wine, the food and the beautiful surroundings. I had a chance to sit down and talk to the owners – a sweet couple named Emel and Wayne. A Turkish / English couple who met in England and traveled to Turkey to open a restaurant. It happened in 2007 and since then the Vanilla Lounge has been a reality. They have made it so far, that the restaurant is ranked No. 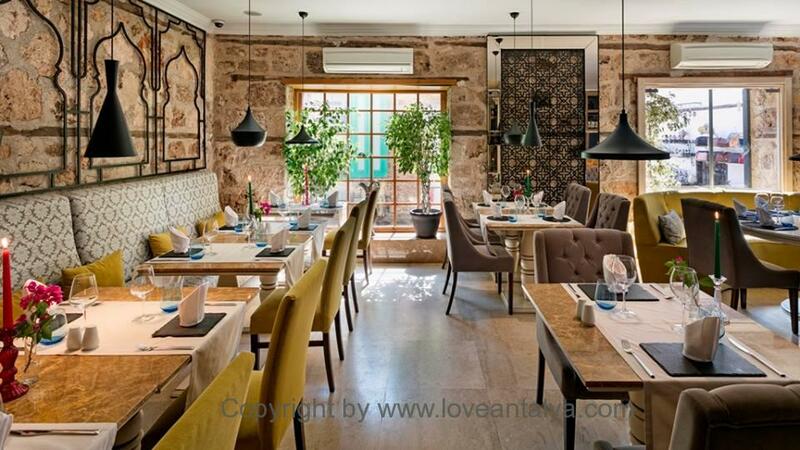 1 on Tripadvisor over the best restaurants in Antalya – out of 944 !! People stand in line with superlatives over the place and the food. This is nothing less than excellent (and very hard work), in a city, where there are hundreds of restaurants and maybe more 1000 dining places. But ts was also some very fine people I got a glimpse of. 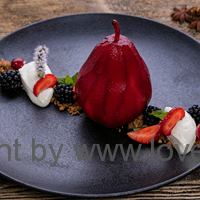 They run the restaurant together and share the tasks – Emel as a hostess with an overview of the restaurant and Wayne as a Chef in the kitchen. The kindness and courtesy of the couple, clearly reflects on the staff and the atmosphere of the restaurant. So it’s not a coincidence, that Vanilla Lounge Restaurant has come to where it is now – No. 1 in Antalya. There is a lot of hard work behind, but also many innovative thoughts, which I think are extremely important. Ex. they have a small garden inside Kaleici, very close to the restaurant, where they grow some of the vegetables and their own herbs (and bourgonville flowers) to use in the food. They use and care about organic food and commodities of the region and the surrounding Antalya mountains. I’m really fond of this kind of rethinking and reaching out of the box. This thinking, together with their skills, helps to make them and the restaurant different from most others in Antalya. Actually it was really fun meeting Emel and Wayne, because in many ways, they reminded me of my own story. We had a lot of common points, where we could relate to each other. At least I was sitting with a big smile most of the time recognizing their story. And we also astonishingly quickly came to talk about family, how hard it is to have young children close to each other, to be a mixed couple with roots in several countries (I also have family in England), starting companies (and trying to cope with small kids on the sideline) and having an interest in food. They were so nice and open, so it was almost as if you had known each other for several years. So I have promised to drop by next time we are in town – this time with my husband and kids. In case you wonder: YES, this is article is sponsored by Vanilla Lounge Restaurant. But on my own initiative, I contacted them and asked, if they would like to join in. Fortunately they did – and lucky for me, because what an experience. I sincerely hope, that others want to visit and experience this restaurant, because it has truly been a great pleasure and an eye opener for me. 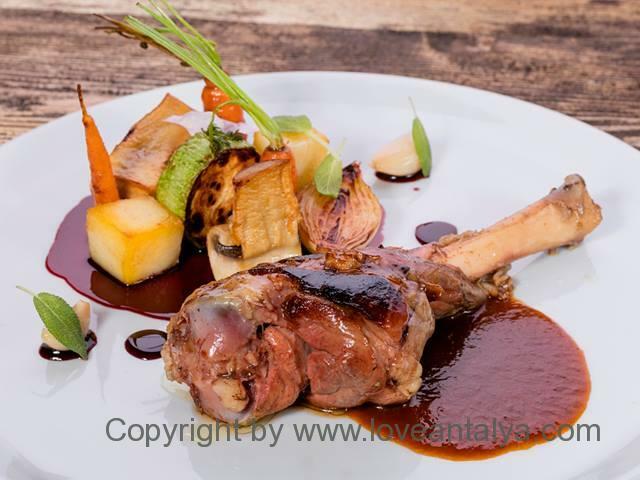 This is what you can with pure will and innovative thoughts, and it’s what the food scene in Antalya also can present and offer in addition to traditional local food. You can find their website here: Vanilla Lounge Restaurant. « Hvad er Ramadan og hvorfor er den stadig vigtig?